Edo State Governor, Mr. Godwin Obaseki, on Thursday night, met with political party leaders and other critical stakeholders in Benin City, to set agenda for an all-inclusive and effective governance of the state. Governor Obaseki, while declaring open a 3-day strategic policy dialogue workshop with the theme: Setting Agenda for the new Administration, noted that the dialogue was to build a consensus of the policies and strategy expected to be pursued by his government, a statement by the Chief Press Secretary, Mr. John Mayaki said. Governor Obaseki said his administration desires to have an honest, incisive and thought provoking dialogue. According to him, Edo state undoubted, easily ranks among one of the few states in the country that can boast of the largest concentration of “Brain Power” adding that these abundance of “Brain Power” abound in the diverse areas of governance, academia and professionals. According to him: ” Edo state easily ranks among one of the few states in Nigeria that can boast of the largest concentration of brain power and these brain power span the whole diverse area of governance through to the professionals, academia, and in every diverse of our economy – Edo people come on top. “Therefore, I am very pleased to bring those of you who are not Edo citizens to join in this worthy task of building a legacy for our people. Eight years ago, we had a vision of what we called the Edo Project and I’m happy that some of you here today were part of that project. “It was clear from the beginning that we wanted to be at the index of functioning states in Nigeria to reclaim the position and rank we have always occupied since we became a region and a state”, he stated. 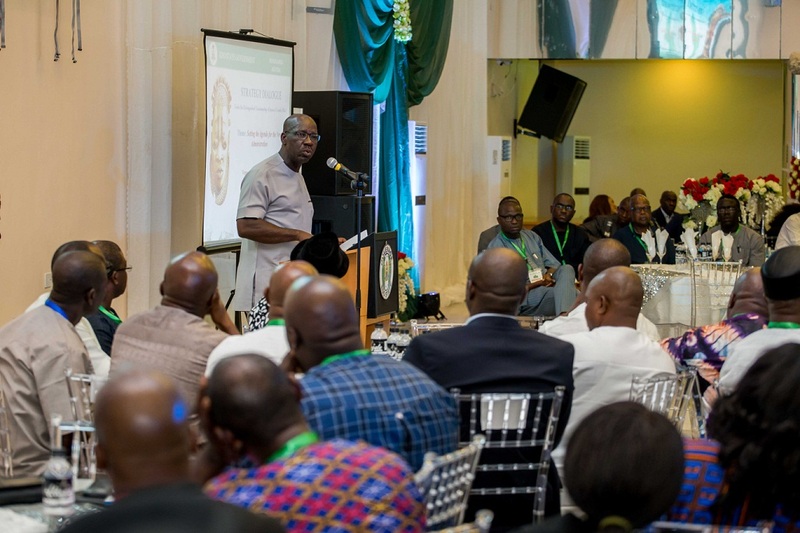 He explained that in spite of the various challenges, the state had over the last eight years been able to build a strong foundation for the take-off of the Edo project “which is what I campaigned on and it is time to build on that foundation and that is exactly what we are trying to do now. “We now want to engage the great minds of our state in this country to help us build an inclusive and enduring state. “We need institutions that will help us unlock the ingenuity of our people, our land and location in creating an economically prosperous and socially stable Edo state”. Governor Obaseki further said that the meeting was very inclusive as those invited cut across political divide in the state, the civil society groups, traditional rulers as well as religious leaders. He emphasized that the composition of the dialogue was strictly on political considerations as the aim was to build consensus. His words, “We have gone round institutions and selected individuals whom we expect to represent a view point of the institutions or communities they represent. Members of the political class were invited from every local government but not based on authority anybody commands”, he said. Earlier, the chairman of the occasion, retired Justice Samson Uwaifo, stated that effective leadership required good decision making, describing the workshop as revolutionary approach to governance. The former Supreme Court Judge therefore urged the people not to misunderstand or abuse the dialogue platform as it was a sign that the governor was ready to serve with the best of intentions. His words, “I think the move to set the Agenda for the new administration in Edo state is well conceived. No doubt it is the first of its kind and the essence of it is revealed in the vision and mission set out. The vision for the thematic pillars so systematically analyzed is quite attractive and demonstrates a revolutionary approach to change in the art of governance. “This is a practical exhibition of this administration to ensure inclusive government. Let me sound an admonition that this new era of governance should neither be misunderstood nor abused by any one in whatever sense. Let it be taken with gratitude that it is a sign that the Governor has offered to serve the people with the best of intention”, he said.